The clean, polished look of our Contemporary Classic Office Stool will beautifully accent your conference room or meeting area. In stock in Black or White! 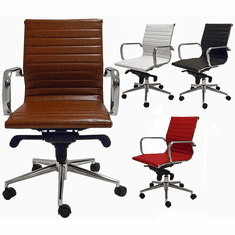 Great for use around standing height conference tables, tall reception desks or around high top meeting tables. IN STOCK! 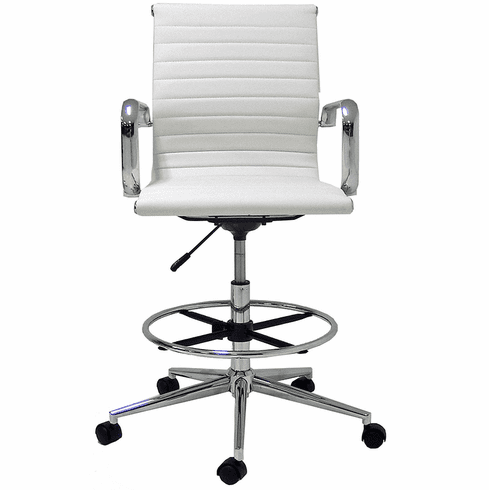 The Contemporary Classic Office Stool features a bright and sleek chrome metal chair frame, arms, foot ring, gas lift post and base. 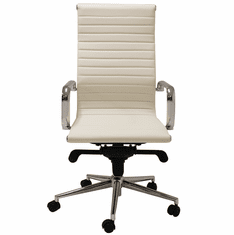 Chair is upholstered in a ribbed bonded leather over the chrome chair frame and comes in your choice of Black or White. Seat height range extends from 23"H to 32" from the floor with the pneumatic lift function. 20" diameter height adjustable footring can be raised or lowered with a total adjustment range of 7-1/4" from lowest to highest setting. Dual wheel carpet casters come standard. Soft casters for hard floor and fixed height floor glides sold separately below. Contemporary Classic Office Stool measures 22"W x 20-3/4" x 40-1/4"-49-1/4"H overall. Seat measures 18-1/2"W x 17-3/4"D. Back measures 18-1/2"H from the seat. Weight capacity 250 lbs maximum. Shipping weight 40 lbs. All components exceed ANSI/BIFMA commercial use requirements. Meets CA fire foam approval. 5-Year Limited Warranty. Ships unassembled, however assembly is minimal with only four screws. PRICE INCLUDES SHIPPING!